You’d never guess there was now a gin distillery in Balham, South West London, and, if you didn’t know where to look it’s unlikely you’d find it if you did. I went past the rather secret entrance a few times. I rather expected something Victorian, Dickensian even, but no. The converted industrial unit is shining bright and beautifully fitted out inside. You know Grand Designs? Or as we call it in my home ‘Better Houses Than Yours’? Well this is the kind of thing that gets Kevin all excited. The luxurious ‘lounge’ area melds contemporary with antique, some of the founder’s desks are here, to create a beautiful effect while presiding majestically over the whole area are the three traditional copper pot stills. – Marjorie, Karin and Miranda. To the side is a ‘kitchen’ where experimental distillations are tried out and above that a rather nice bar, well-stocked with gin of course. 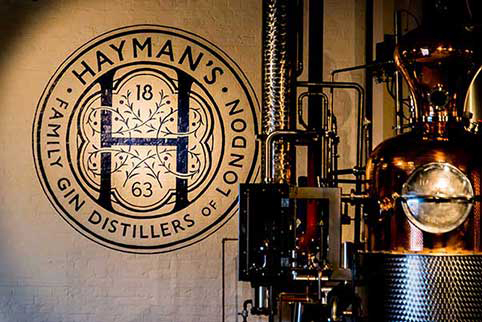 The distillery is brand new but is a return for Hayman’s. As Miranda Hayman, great-granddaughter of the founder James Boroughs tells me, the original distillery was just a few miles away in Chelsea. Then it moved out to Lambeth in 1906, then to Kennington Oval and finally to Witham in Essex. Firmly back in the family’s hands in 2013 the brand regained its style and allure. The move to Balham this year, Miranda says, feels like coming home. ‘‘Twenty or so years ago, gin was in the doldrums,’ she says, ‘and even when we started putting our name on a bottle again gin still wasn’t that big. The excitement and buzz that’s now around gin and gin distilling is amazing and it’s what’s enabled us to come back to London and just four miles from where it all began”. I wonder if gin could hit the doldrums again, after all what’s cool can also be short-lived, but Miranda thinks not. “Gin transcends all age groups so I don’t think this buzz is going be just fashionable with young drinkers and then die away. I think too that the gin thing is part of a wider movement with people wanting authenticity, to know what they’re drinking and its provenance and that’s what this distillery is about, showing people how our gin is made, the whole story and experience”. And why Balham? “It has a rail and a tube station and it’s easy to get to the airports from here by road, so it’s good for our sales. Balham itself has been very welcoming and it’s got a great food and drink scene, with Brixton not far away. And we found the ideal place to create the distillery in this old building. We like the feel of the area and it suits us”. Having taken an abridged but very informative version of the Distillery Tour I sat down for a G&T and a bit of a tutored tasting of Hayman’s three core gins. Hayman still distil gin the way it they did it 150 years ago using the family recipes and with no modern twists or turns. 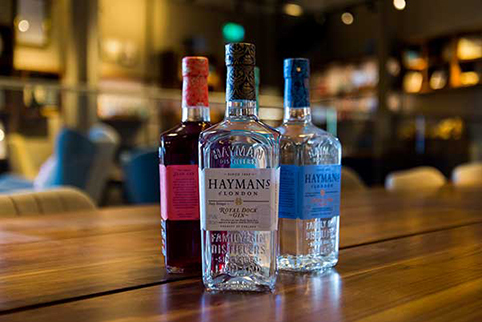 Their London Dry Gin uses the two-day process; first the botanicals are put directly into the neutral spirit, in Hayman’s case 100% English wheat, to infuse for 24 hours before distillation the next day. 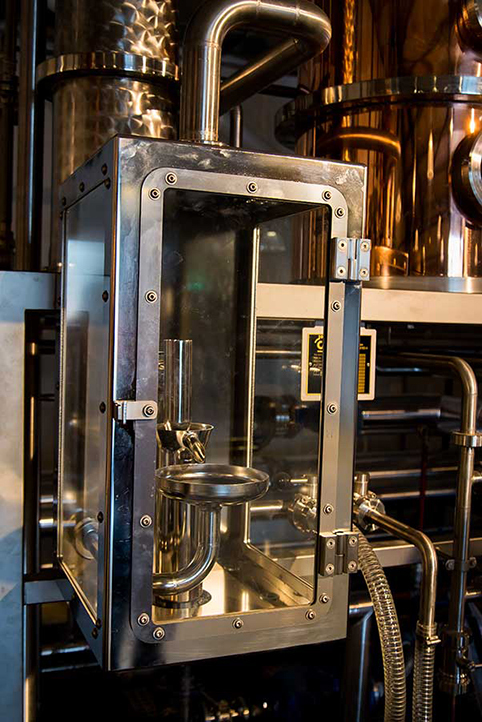 Other gin makers often use a basket – the spirit passes through as vapour when distilling – to add their flavourings. You’ll find adherents of both methods are convinced their way is superior, I’ve tried both and I land on the steeping side of things. Juniper is the primary addition, of course, as Miranda tells me. No gin is really gin without juniper. Cracking open a berry from a bowl on display we instantly get that classic gin aroma and feel the oiliness on our fingers. 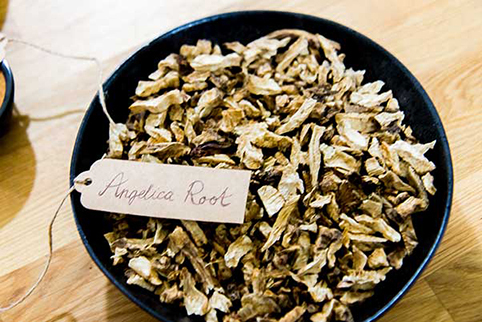 Ten botanicals are used in all and they can all be experienced in the kitchen, these include orris root powder, dried orange and lemon peel, angelica, coriander seed and nutmeg. The result is a gin that has all these elements on the nose, but is well-balanced with no overbearingly predominant aroma and is very smooth on the palate. 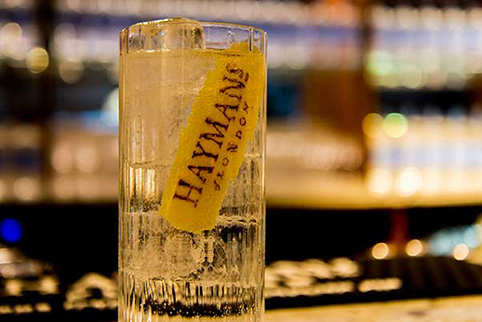 Hayman’s London Dry really is the perfect gin for a classic G&T for this reason. We next get our noses into Hayman’s Old Tom. You can smell sweetness and you can taste it too and that’s no surprise as small amounts of sugar are used in its creation as well as liquorice. Back in the day, I’m told, bad gin makers used sugar to hide the rotten taste of their product, but many people actually got a taste for a sweeter gin and now even a high-quality producer such as Hayman’s make what’s called an Old Tom style gin. And so, to sloe. Hayman’s Sloe Gin. Viscous when poured, the aroma of plums and prunes is quite heady. Not surprising as sloe berries look rather like miniature plums and come from the same botanical family. 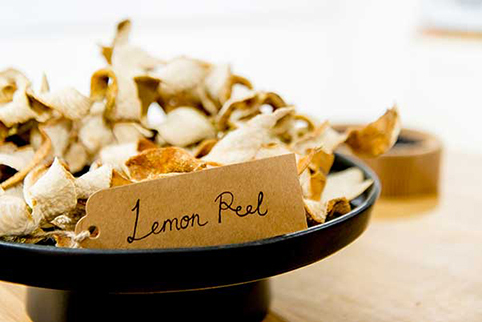 Harvested in the autumn, ideally after frost has hit them, they are steeped in Hayman’s gin for several months. It’s a deliciously rich drink that’s not oversweet and with a wonderful garnet colour. Leaving Hayman’s, I come away with an impression of deep family pride in their product and a real sense of whilst they celebrate their glorious gin past they are in no way backward-looking. Hayman’s are not chasing a trend, simply benefitting from a market that once more values high quality and tradition. With summer not that far away, I predict lot of G&Ts are going to be happily made with Hayman’s this year. 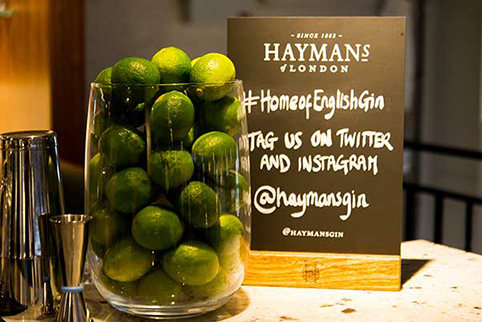 This entry was tagged botanicals, culinary tourism, gin, gin still, haymans, nick harman. Bookmark the permalink.